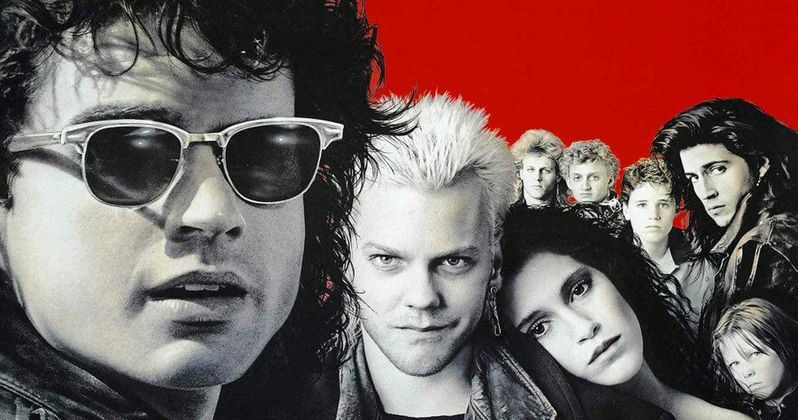 The CW has officially ordered a pilot for The Lost Boys TV series. The show was originally announced in 2016 with Veronica Mars creator Rob Thomas attached, but a pilot was never ordered. Even though the pilot for the series based on the 1987 horror classic didn't happen three years ago, the project has been said to be a favorite amongst network brass. Thomas is on board once again, but Heather Mitchell (Scandal, Grey's Anatomy) has been brought on to pen the pilot script. The Lost Boys fans have been waiting years for a new project, so this should be some pretty big news to hear that it's finally moving forward. While there is no guarantee that it will get picked up, having Rob Thomas and Heather Mitchell involved, along with the excitement of the network, it seems like this one is a no-brainer. In addition to the pilot announcement, a brief synopsis was released, which you can read below. Welcome to sunny seaside Santa Carla, home to a beautiful boardwalk, all the cotton candy you can eat...and a secret underworld of vampires. After the sudden death of their father, two brothers move to Santa Carla with their mother, who hopes to start anew in the town where she grew up. But the brothers find themselves drawn deeper and deeper into the seductive world of Santa Carla's eternally beautiful and youthful undead. After reading the synopsis, it looks like The Lost Boys series will fall in line with the 1987 movie. As far as casting, there have not been any announcements as of this writing. However, there are more than likely a few fans of the franchise that hope that Corey Feldman will be able to get involved in some capacity. He might be a little too old to play the role of Edgar Frog again, but there could be a spot for him in there somewhere. The actor would probably love to have some kind of part in the series and he could probably offer up some insight into the making of the original movie. When The Lost Boys TV series was first announced in 2016, it had a different premise. The initial idea was to keep the young vampire cast the same and have each season take place during a different decade, which sounds like a pretty cool idea. However, it looks like they're going back to the basics this time around. When talking about the project in 2017, Rob Thomas revealed that he wanted to make his TV show vampires bad in comparison to the ones that are normally shown on TV and to be true to the source material. He also revealed that his main vampires would be different from the movie since they died in the 1980s. Related: Frog Brothers to Become Frog Sisters in The Lost Boys TV Show? It's not clear if Rob Thomas is keeping his view on the vampires the same for The Lost Boys TV series. Thomas seems like a fan of the 1987 source material and has hinted at bringing some of the Peter Pan elements back into the storyline, tempting the brothers to want to stay young forever. Some of that imagery was pulled from The Lost Boys, and unless things have changed, that's what Thomas wants to do with the TV series. Some fans may be more than a little concerned that the show is happening on The CW instead of Netflix and that the show has a Grey's Anatomy writer attached to write the pilot, but let's not judge it before it hits the airwaves. This news was first reported by Deadline. Frog Brothers to Become Frog Sisters in The Lost Boys TV Show?